In the current situation, the use of plastic products dominates our daily lives. But plastic is not just polluting the environment, it is also confusing animals. Yes, you read is right. A video shot in Goa is going viral on social media for a shocking reason. We can see a Cobra struggling to spit out a plastic bottle that it accidentally swallowed. 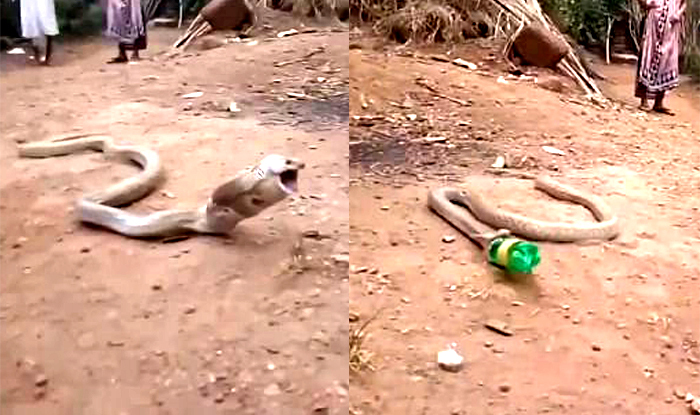 The footage from Canacona Taluka, Goa shows the snake slowly trying to squeeze out a green-colored bottle from its belly as curious people watch. 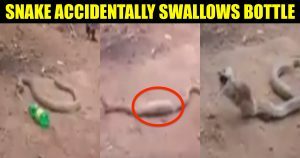 As soon as the snake squeezed out the bottle, everyone shocked seeing the bottle coming out of cobra’s belly. We can also see a rescuer handling the snake. “There is no clear information why the cobra gulped down the bottle, but there is every possibility that the bottle might be having rat or frog in it due to which he had it,” the official said. The unharmed Cobra was later released into the wild. However marine animals swallowing plastics have been a common thing reminds humans of the destruction caused to the environment. This is not the first time animals consumed plastic assuming it to be food there have been similar incidents in the past. Plastic has pushed several animals to the brink of extinction. Many die after ingesting it or becoming entangled in plastic waste. Earlier this year, we had seen a video of a snake drinking water from a bottle had gone viral. The incident happened in Karnataka due to the drought conditions in the area.